“Esfuercese Mucho. 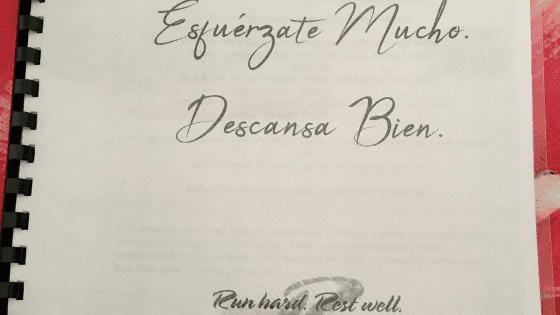 Descansa Bien.” is Spanish for Run Hard. Rest Well.! • Run Hard. Rest Well. “Esfuercese Mucho. Descansa Bien.” is Spanish for Run Hard. Rest Well.! Nate Lowe, one of our Run Hard. Rest Well. presenters, led two Run Hard. Rest Well. workshops in central Mexico this month for pastors, leaders, and educators. It was the first time he worked with a translator to share the God’s four Restorative Rhythms of Rest. All participants received a copy of the Vantage Point book – now translated into Spanish! These resources assist their ongoing training and personal accountability. This is an exciting time for RHRW as we continue to share God’s good gifts of rest around the world. Thank you for your prayers and support. Together, we are making a difference! Well done, Nate! He has been and still is a great blessing from God.